If ever the influence of a single man was to be illustrated in the modern game of football, you’d need to go a fair distance to find a better example than the exhilarating start Gordon Strachan has made to the Scotland national squad. A matter of months ago, Strachan took over a Scotland side that was unquestionably on the ropes, with an apathetic support and a team verging on the dreaded ‘pot 5’ seeding position. Now, with a modest number of personnel changes, Scotland are resurgent, thanks to that insatiable, nippy belief Strachan has injected into the squad. In our last four competitive matches, we’ve won three (two of which were against the top seed in the group), and narrowly lost one. Strachan’s injection of belief into an ailing squad has shown just exactly what one man can do. This leads us to wonder, how much farther could we go with a top English Premiership striker firing on all cylinders. 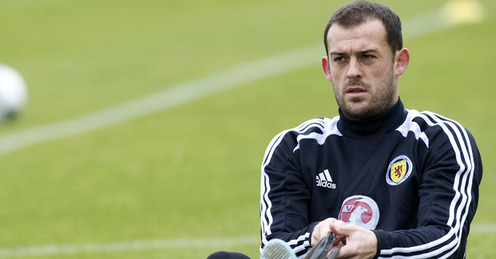 Enter, Steven Fletcher. The big target man is now just days away from making his domestic return for Sunderland, and what a shot in the arm for Strachan’s men he’ll be if he stays injury free, and on top form for the national side. It’s forever been a complaint of the long suffering Tartan Army that we don’t have a world class striker (with the physical stature of Fletcher at least). The former Hibee’s Scotland career has been stunted due to disagreements with former managers, and long-term injuries, but we’re now ready to forget about all that, and get behind him, as he could be the man to fire us to Euro 2016. Throughout Fletcher’s career, he’s always been a goalscorer, and since his move to England, his rate has improved gradually, despite playing against increasingly difficult opposition. Scotland fans will be hoping and praying that this trend continues and transfers over to International level. His physical prowess and intelligence to read the game in that position will fill a void for Scotland that’s been there for over a generation. The introduction of that type of player gives us a threat in the air from set pieces, someone who can hold the ball up well, and someone who can bring other players into the game. The absence of that type of player has forced us to play pacey players as lone strikers, without any real physical dimension to our attacking play in the last third. Even against Croatia on Tuesday night, Strachan played a 5ft 10in Steven Naismith as something of a target man. Naismith, to give him his due, did incredibly well (as you’d expect with such a tenacious attitude to his play), but his talents in the side would ideally be utilised elsewhere. With Fletcher as the target man striker, players like Naismith, Jordan Rhodes and Shaun Maloney would ultimately feel the benefit. His ability to hold the ball up, and feed into a smaller, pacey striker/winger, could be the key to forging a successful striking partnership (something else we’ve lacked for a significant number of years). At only 26, Fletcher’s best years are ahead of him. He’ll hopefully be coming to the peak of his powers for the next qualification campaign. He’s looking better all the time scoring more and more goals, and learning from experience in one of the best leagues in the world. He could be the key to our qualification hopes. There’s much in the way of patience and hard work to follow for Scotland. It’ll be almost a year before we play another competitive match, but we all know, for Gordon Strachan, there’s no such thing as a Friendly. The fiery Scot will have his players pumped up to play USA in November, and whoever comes along before the Euro 2016 campaign kicks off. The Tartan Army will be in strong voice, the enthusiasm is brewing once more, and we could have a star striker to make all the difference.